Stunning. Awe-inspiring. Revolutionary. Superlatives can’t aptly describe the immersive experience of reading Aaron Safronoff’s lavishly illustrated fantasy fable for the first time. The story is set on the world of Cerulean—essentially a star at the center of a vast ocean covered by a massive, multi-leveled floating forest inhabited by diverse sentient creatures. It revolves around a trio of heroic young Arboreals who set out on a quest to find out why the Great Trees are dying and, ultimately, to find a way to save their failing world. Protagonist Barra Swiftspur is a Listlespur (clawed, simian-like beings covered with fur and sporting a long tail) whose life is turned upside down when she finds notes left by her adventurer father, who disappeared and is feared dead. The notes mention a deadly fungus known as Creepervine, a quickly spreading blight that her father believed could endanger the entire bionetwork. But community leaders have long dismissed her father’s warnings; even Barra’s mother won’t discuss the potential problem with her. So, against her mother’s wishes, she leaves with two friends and ventures to the dangerous Middens and the mythic Root, the region of Cerulean at the base of the Great Trees where no other Arboreal has gone before. 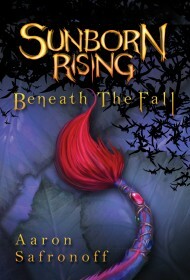 Sunborn Rising: Beneath the Fall is nothing short of a game-changer in the world of all-ages fantasy literature. Visionary, thematically profound, and visually spectacular, this mesmeric fusion of Ursula K. Le Guin’s Hugo Award-winning novella The Word for World is Forest and James Cameron’s Oscar-winning motion picture Avatar will entertain readers young and old and leave them wanting more. It’s an instant fantasy classic.